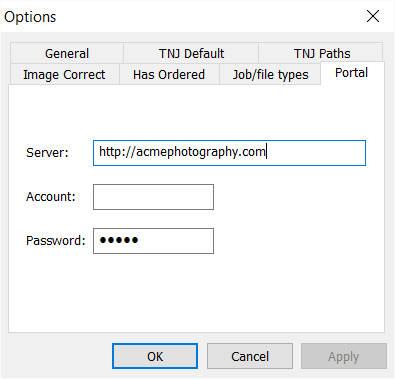 When uploading jobs to the Timestone Internet Ordering System (IOS) two options are available with respect to how orders are subsequently handled. The term 'pre-orders' is used because the most common use of this method is for taking orders prior to photography day. However the pre-orders method can also be used with images after photography. Orders received for a job uploaded with the 'pre-orders' method are downloaded into the software. Unlike Fulfill, the orders are not automatically downloaded, instead the download is triggered by the user. As such the pre-orders workflow lends itself to batch handling of the orders. Before orders can be downloaded into Orders Mode the application needs to be configured to communicate to the IOS server. This is done in File>Options>Portal as per the screen grab below. Pre-orders are downloaded into Orders Mode via Orders>Download online orders. Each online order is described by at least two rows. The header, shaded in grey, specifies the order date, order key and customer (the person who placed the order). 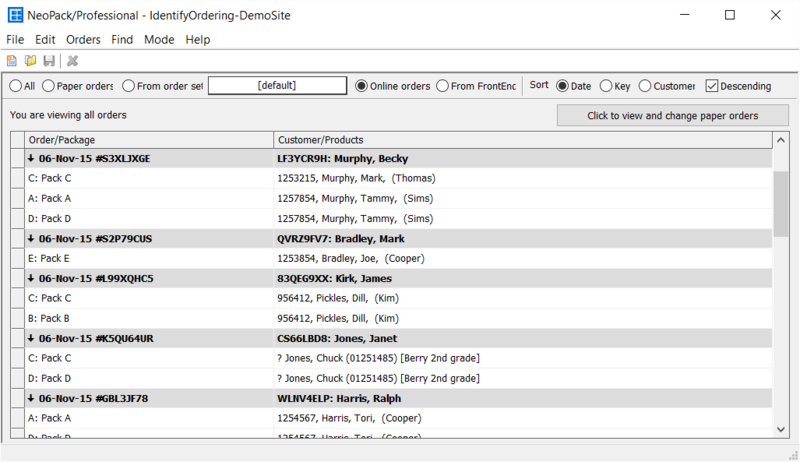 Below each header is a row for each package in the order and the subject for whom the package was ordered. In the screen grab below the first order was placed by a Becky Murphy on November 6th 2015. The order key is S3XLJXGE. She ordered packages C for subject Mark Murphy and packages A and D for subject Tammy Murphy. Mark Murphy has an ID of 1253215 and is in a folder 'Thomas' while Tammy Murphy has an ID 1257854 and is in a folder 'Sims'. Pre-orders can be deleted in Orders Mode but cannot be re-processed. This is an important distinction between pre-orders and paper orders. Fulfill is a stand-alone utility capable of printing all IOS orders including composites (as per NeoComposite/CompositeBuilder and named groups (as per NeoGroup/GroupBuilder). Fulfill connects directly to the IOS web server, automatically downloading new orders every 60 seconds. Orders may be printed in the sequence they were received, or batch printed for a particular job or date range. It is possible to switch from one method to another at any time. Consider a common workflow as outlined below. Prior to photography you would like customers to go online and 'pre-order' their packages. These orders will be downloaded into the software and processed along with paper orders taken on the day of the shoot. After photography you would like the job to be again available for online orders but this time with images and with orders now being printed in Fulfill.